Securing food for growing populations while minimizing environmental externalities is becoming a key topic in the current sustainability debate. This is particularly true in the Mediterranean region, which is characterized by scarce natural resources and increasing climate-related impacts. A new study, carried out by the MIO-ECSDE member Global Footprint Network in collaboration with the International Centre for Advanced Mediterranean Agronomic Studies in Bari, focuses on the pressure Mediterranean people place on the Earth ecosystems because of their food consumption and sourcing patterns and explores ways in which such pressure can be reduced. To do so, it uses an Ecological-Footprint-Extended Multi-Regional Input-Output approach applied to 15 Mediterranean countries. Results indicate that food consumption is a substantial driver of the region’s ecological deficit, whereby demand for renewable resources and ecosystems services outpaces the capacity of its ecosystems to provide them. 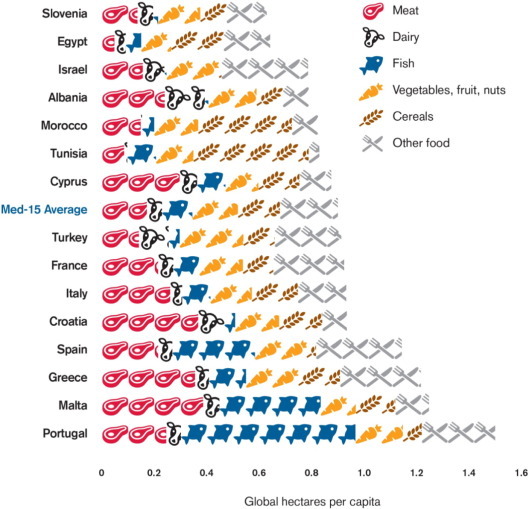 Portugal, Malta and Greece are found to have the highest per capita food Footprints (1.50, 1.25 and 1.22 global hectares (gha), respectively), while Slovenia, Egypt and Israel have the lowest (0.63, 0.64 and 0.79 gha, respectively). With the exception of France, all Mediterranean countries rely on the biocapacity of foreign countries to satisfy their residents’ demand for food. The study by analyzing the effect of shifting to a calorie-adequate diet or changing dietary patterns, points out that the region’s Ecological Footprint – and therefore its ecological deficit – could be reduced by 8% to 10%. Per capita Ecological Footprint of food consumption (fEFC) broken down by product type based on data for 2010.